Standard deviation channels are plotted at a set number of standard deviations around a linear regression line. They can be usefully applied to swing trading (as well as for detecting changes in momentum). Visually identify a stable trend on the chart and fit standard deviation channels by dragging your mouse over the selected time period. 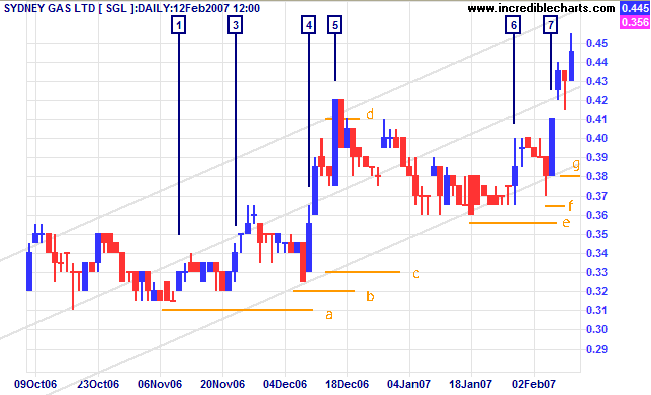 Sydney Gas Limited [SGL] is plotted with trend channels drawn at 2 standard deviations around a linear regression line. 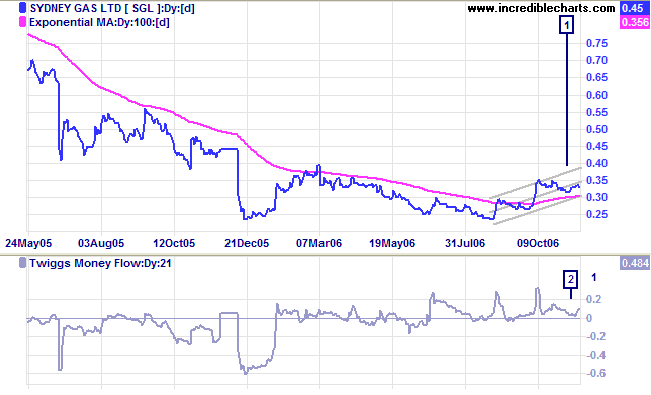 After equal lows in December 2005 and August 2006 SGL started to rally. The signal to go long is identified when the secondary reaction (or consolidation) at  respects the 100-day Exponential Moving Average. Accompanied by strong accumulation with Twiggs Money Flow holding above the zero line. 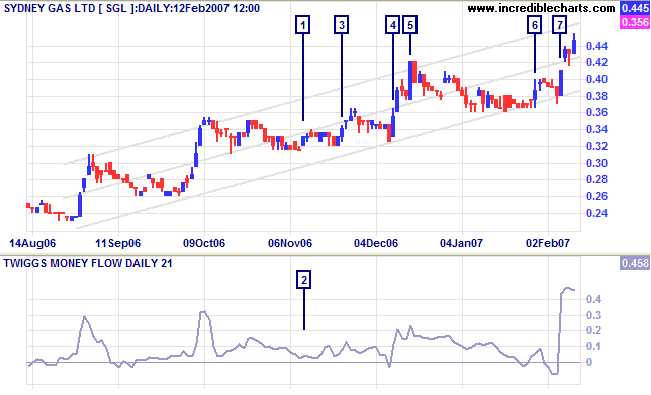 Channel lines are extended using Auto-Extend (right-click on the trendline). An opportunity to increase (pyramid) your position when price respects the lower channel line. Place your first stop loss below the down-swing at  on which you entered. the low of the trough. If the new stop level is lower than the previous stop, leave the (higher) old stop in place. Even if the trough is in the upper half of the trend channel, set the stop loss at the lower channel line. When price penetrates the top trend channel, move your stop loss to the upper channel line. If price breaks clear of the channel, keep on moving your stop up along the upper channel line each time that a new trough respects the channel line. The next trough is in the upper half of the trend channel, so set the stop loss at the lower channel line. See Help: Trend Channels for directions on how to set up standard deviation channels. I normally use 2 standard deviations, which enclose roughly 95% of the selected data. Using 3 standard deviations encloses about 99% of the selected data but the channel often appears too wide.